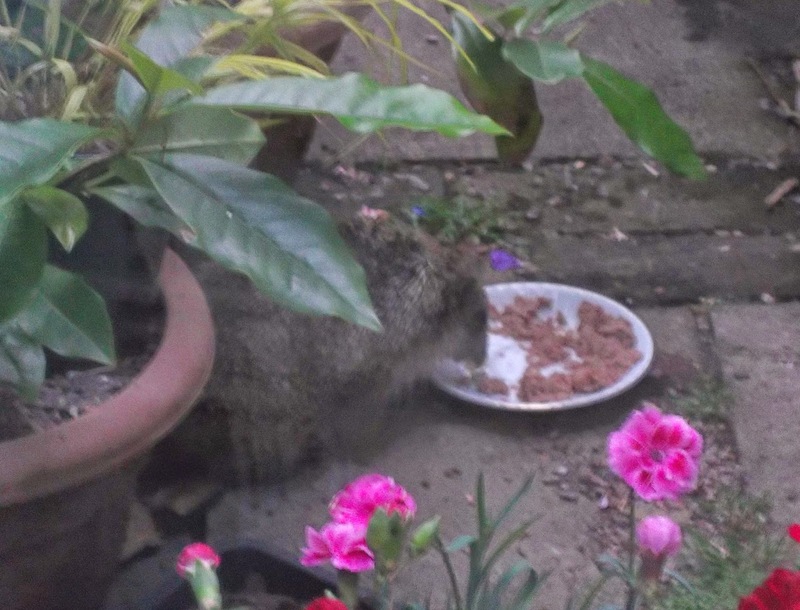 No, not visiting someone else's garden, but a visitor to ours. 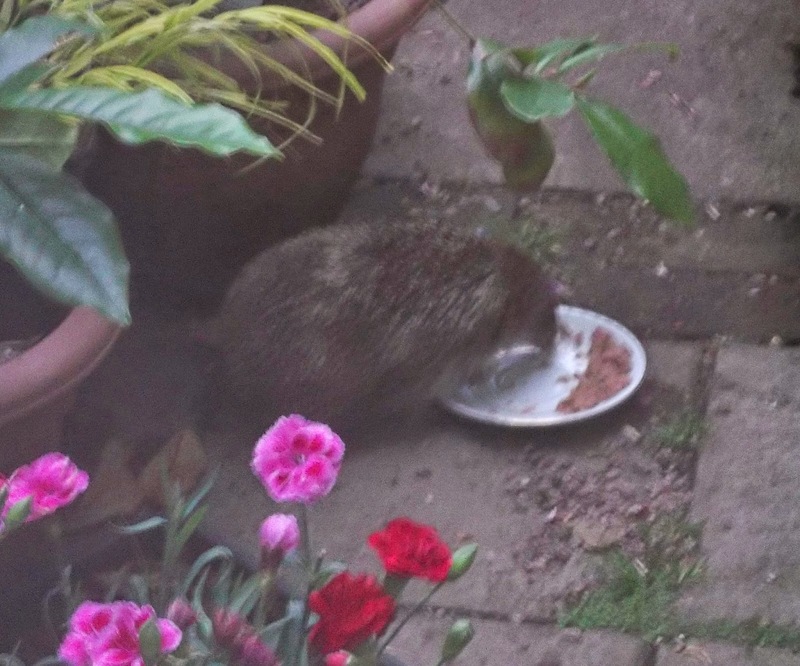 Last week, I saw a hedgehog hiding among the pots by the back door. My first though was one of panic, in case Scruffy was anywhere near it, but he wasn't. It was around 8.00 pm, so apologies for the light levels and general blurriness of the photos which were taken looking through our sitting room window. 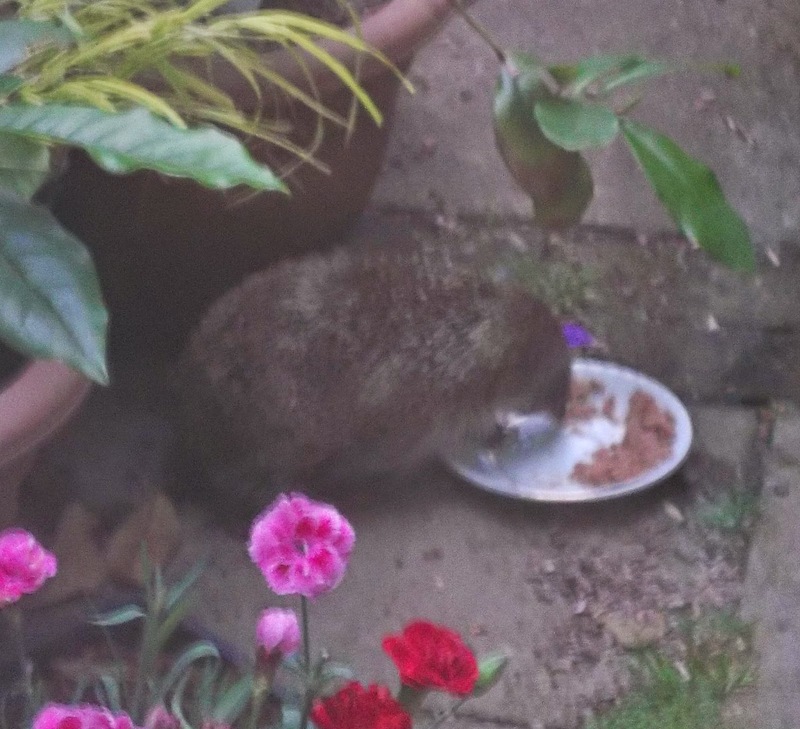 I put some cat food out for the hedgehog and once he/she had smelt it, it didn't take long for it to be gobbled up. I think he/she was even standing on the plate to get at it! He/she did finish every last bit and then off he/she went on his/her way. I was thrilled to see a hedgehog as we live in a city, particularly as on the Hampton Court Palace Flower Show coverage on the BBC, there was a report on how these creatures are as endangered in the UK as tigers are in the wild. 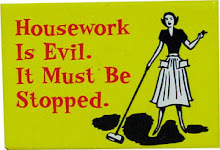 Rather a sobering thought. Thanks, Hannapat. We were very lucky to see him/her. I was a bit concerned that one of our cats would want to investigate the hedgehog, but luckily, they didn't. 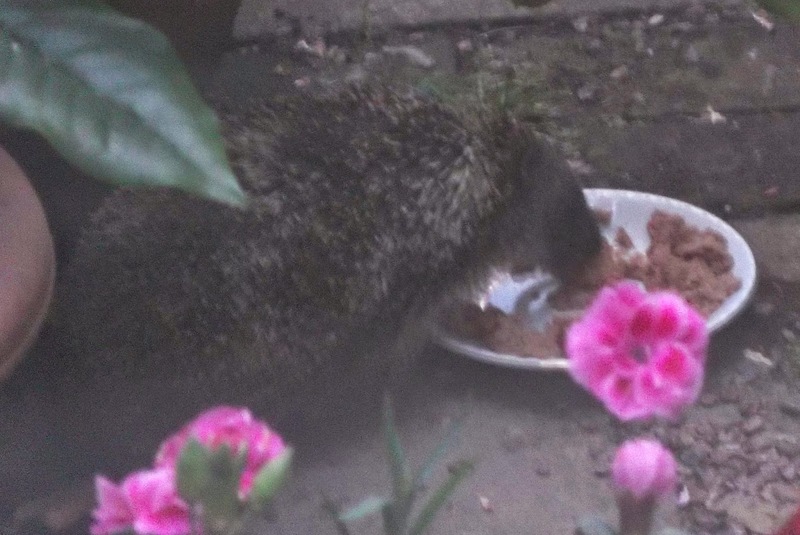 How WONDERFUL to see a hedgepig in your garden. And how sad to learn that they are critically endangered. Thanks, EC. We were indeed very lucky - we don't see many hedgehogs in the garden. It is sad that they are endangered - due to roads and disappearing habitats I think. At east we gave this one a meal to keep him/her going for a bit longer. Ellie how lovely. Bet you don't have the same problem with slugs that we do ! Thanks, Anne. Unfortunately, we don't have enough visits from the hedgehogs and our snail and slug population seems to have exploded this year - they are everywhere! Ugh! Thanks, Alison. We haven't seen him/her since then, but perhaps he/she'll call back soon - I hope so! Thanks. Joy. We were very lucky to see our visitor. It is very sad that they are so endangered now. I hope they'll keep going somehow. I hope they can survive as a species.